Meryl Nass, M.D. 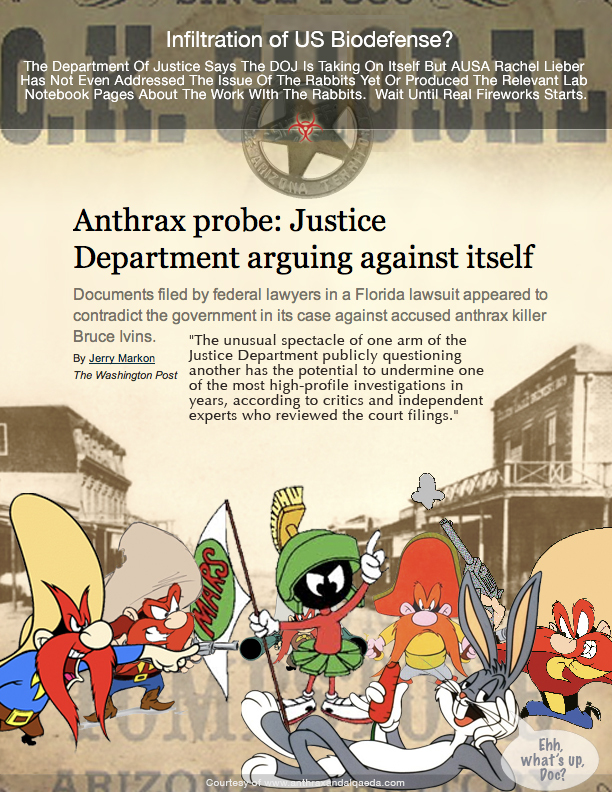 … The FBI botched its investigation, never had even the shred of a case against Ivins « CASE CLOSED … what really happened in the 2001 anthrax attacks? « * GAO-15-80: Published: Dec 19, 2014. Publicly Released: Dec 19, 2014. Because the FBI botched its investigation, never had even the shred of a case against Ivins, and this is not the first time they were called out on it. The 2011 National Academy of Science (NAS) report pointed out the same things as this GAO report: that FBI and its contractors developed methods that were not validated. 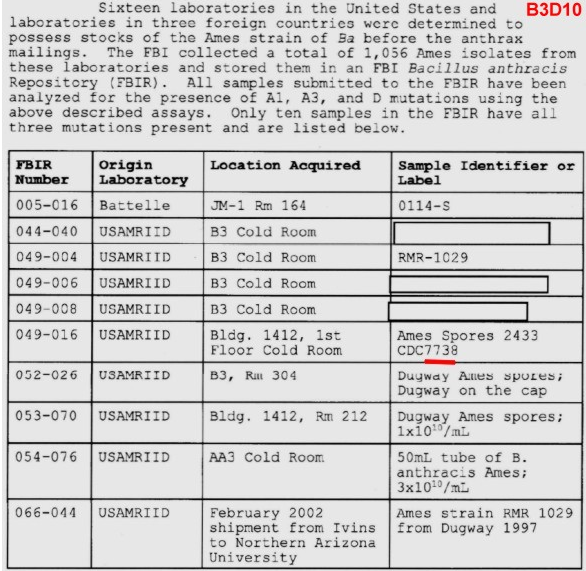 They never proved that the anthrax in the letters actually grew from parent spores in Ivins’ flask, as FBI purports. This failed claim forms the linchpin of the FBI’s entire case. 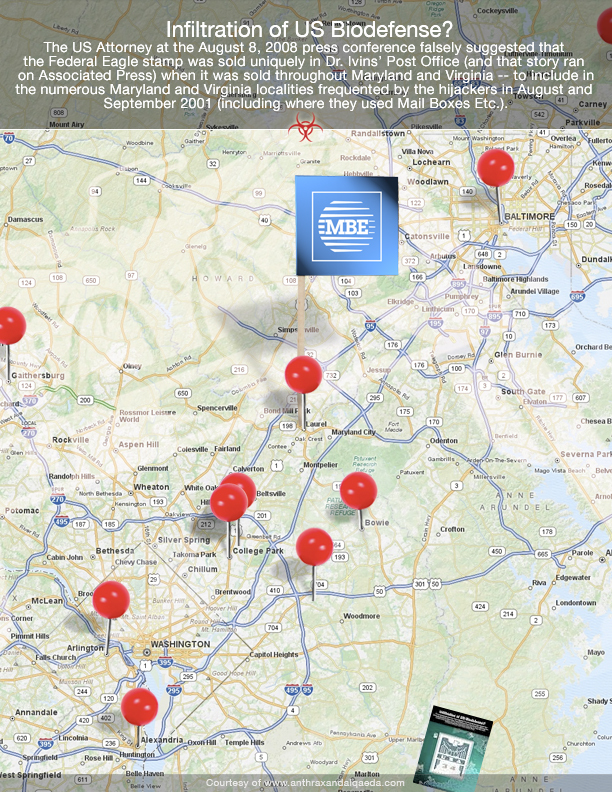 Following the NAS report, in October 2011, veteran investigative reporters at McClatchey (Greg Gordon, who is amazing), PBS’ Frontline and ProPublica dug deeper into the case than anyone so far had done, and created a TV show, a huge online cache of documents on the case, and several journalistic pieces, like this one. Their work revealed new pieces of evidence that further undercut the FBI’s case, like this and this. One article explored the validity of the FBI’s scientific evidence.UPDATE: These reporters write about the new GAO report here. This entry was posted on December 20, 2014 at 1:47 pm	and is filed under Uncategorized. Tagged: *** 2001 anthrax attacks, *** Dr. Bruce Ivins, *** FBI anthrax investigation, GAO review of FBI anthrax investigation. You can follow any responses to this entry through the RSS 2.0 feed. You can skip to the end and leave a response. Pinging is currently not allowed. The Deadly Intelligence motive debunks the speculation about Ivins motive. It juxtaposes former FBI Agent Chacon’s speculation “if” his job security was threatened and the program was threatened with cancellation with the insider’s report that it wasn’t. The FBI was confused about an issue that arose later. Heine was filmed in the Deadly Intelligence episode — and Andrews and Adamovicz have all spoken to the question. One looks in vain for documentary support for the FBI’s position in the thousands of pages available. AUSA Lieber, of course, had no citations in the Amerithrax Summary. It is scary to think that the FBI makes its decisions without requiring sources for factual claims. If Decker claims that there was an email from Ivins to Fellows on the subject in 2001, by all means, the FBI should produce it. Dillon has brought suit against the FBI because the FBI refuses to produce it. The issue of money from a patent is also debunked. A fractional share of a very small amount, Heine explains. Keim, the FBI’s expert, confirms that he has lots of patents that make very little money. I was smitten with Dr. Nass long before I brought a federal undercover to dinner with her in Georgetown. Let’s compare the recent experience of Attorney Stanley Cohen, the former lawyer for the Blind Sheik and Bin Laden’s son-in-law, to see if there are any comparisons and lessons to be learned. Blind Sheik Attorney Stanley Cohen, as he now tells the tale, says the FBI recently was paying his translator $24,000. He was working with Al Qaeda clerics in negotiations with ISIS and is surprised and angry that one of the Al Qaeda clerics was arrested for inciting terrorism. No one every accused Attorney Cohen of being dull. If the FBI and/or a CIA contractor were paying, say, my graphic artist to do the graphics — which according to my intelligence they were — I would be sure to wear my own watch to tell the time. The undercover apparently had first met Meryl some months before and borrowed a couple of books relating to anthrax vaccine telling some hard-to-follow cover story. (He reportedly left Maine abruptly after Ivins’ suicide). When I called Meryl to ask about him, she said she wanted her loaned books back. With the reported return of the books, I welcomed this new transplant from Maine shortly after Bruce Ivins’ death. I had been wondering when the next undercover would show up. Under one scenario, this connection to Meryl could be understood in undercover operations as the “vouch”. But I’m terribly naive and fall for just about anything if people are nice. 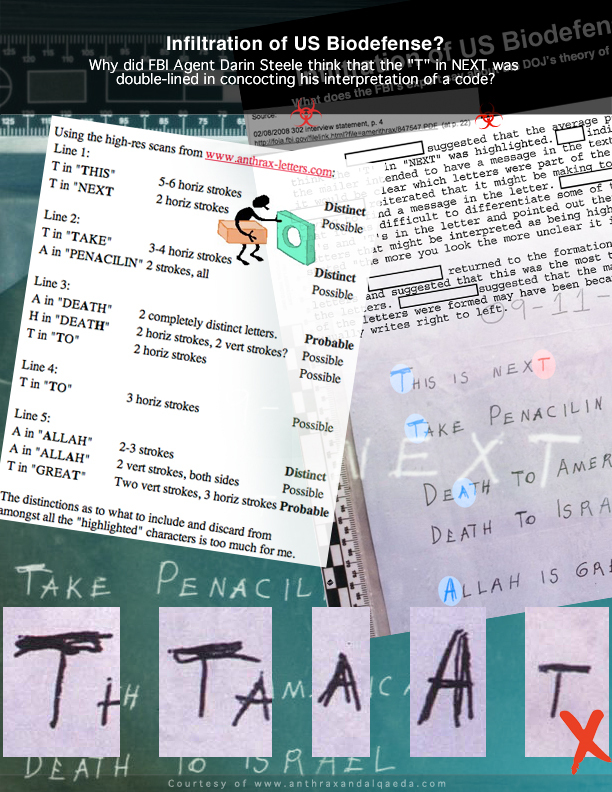 After the FBI closed the case in February 2010 — after a long and fruitless period of the very confused cover story my new friend was telling — he said he was free to do my graphics and argue my Al Qaeda theory. He explained that prior to that, his handler was writing him lousy scripts. Then we never had any problem because I think he did a wonderful job and faithfully represented my views. In my views, I try to very closely track contemporary documents. (If I’ve made any mistakes, I assure you they are of my doing, not the artist). Unless I am saying what a document is saying, I more often than not try to have nothing to say. Beyond what the document says, I typically only have questions. It’s all part of getting people on the same page in solving a difficult mystery. And there’s no reward — in this life or any other — for being wrong. The purpose of my forthright introduction was so that no one would suspect that it was part of an undercover sting or that I was part of any deception. You can doubt my correctness, but shouldn’t doubt my earnestness. By comparison, Attorney Stanley Cohen’s mission similarly was secret except for the part he tweeted every time he went back into a meeting. Attorney Cohen, Some thought questions: Would it have been a good result for Al Qaeda not to criticize ISIS for brutality? Isn’t that criticism a good thing? Isn’t it the fault of ISIS that the hostage died? Isn’t it the fault of people who countenance and give aid to murderers by their propaganda? When did you ever criticize the taking of hostage and the killing of civilians? Did you criticize Bin Laden for 9/11? At least you won’t find Attorney Cohen denying Bin Laden’s actually responsibility for 9/11 — unless someone pays him a lot of money. Barry and Graeme will do it for free. While a bold mission, I think Attorney Cohen was being a tad naive absent a signed agreement. The FBI reports that they don’t even know anything about an email that promised there wouldn’t be an arrest. Is Stanley really going to come back to the United States to report to jail? At least this story explains why he was allowed to travel so widely. FN/ I tried to recruit the undercover to go with me to the farmhouse of the Isabella Gardner gangster Bobby Guarente who last had the $500 million in paintings. It was in Central Maine and was a long drive. When at the last minute he couldn’t go, I was left with a lookout who was only 12 years old. Being raised so well, she insisted she was too young to go to jail for trespass and so remained at the cabin along the river. I had skedaddled from the field near the collapsed barn by the time she reported that two men in suits were looking through the window of the cabin. But I hadn’t even brought my shovel or the ground penetrating radar I wanted the undercover to arrange for the FBI or someone to bring. Then the museum director offering the $5 million reward told me I was making the gangster’s wife nervous asking questions and so I headed home. Graeme’s book is a non-starter because it doesn’t even address Yazid Sufaat’s and Rauf Ahmad’s activities in its anthrax program. Politics has no proper role in true crime analysis. Graeme got his idea that Bin Laden was not responsible for 911 from Barry. It is immoral to use Ottilie Lundgren’s murder as a soapbox for fringe political views. Although the public and Congressional leaders definitely should press hard for release of the 28 pages of the “Joint Inquiry” report, even that effort is undermined by folks who aren’t processing basic facts correctly about 911. 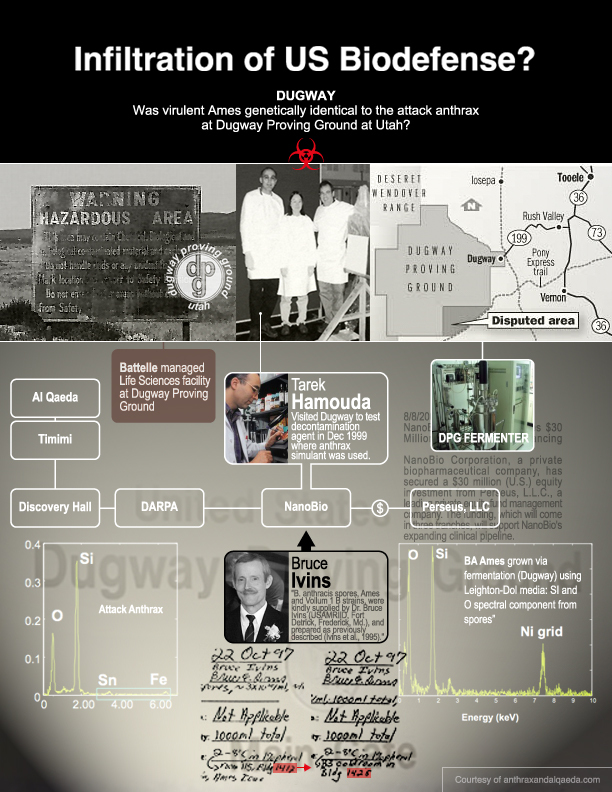 Barry and Graeme will shut you down if you try to address true crime facts about Al Qaeda’s anthrax program rather than focus on their contrived political argument based on articles from 2002. Even on the issue of the silicon signature, they overlook the fact that processing know-how travels in the minds of individuals — and strains can easily walk out of a lab. 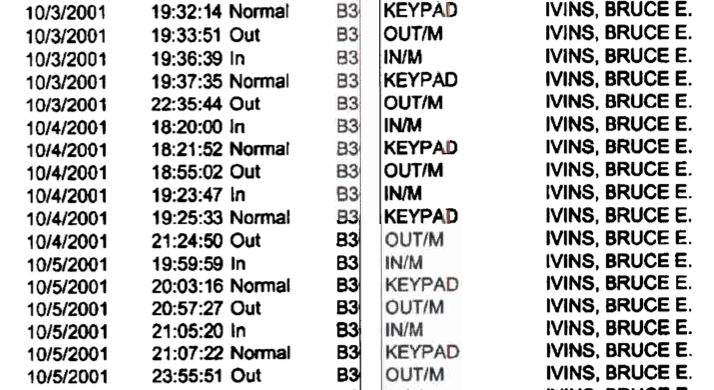 By all means, focus on where the processor got his know-how and Ames strain. But you won’t find that from newspaper articles in 2002. 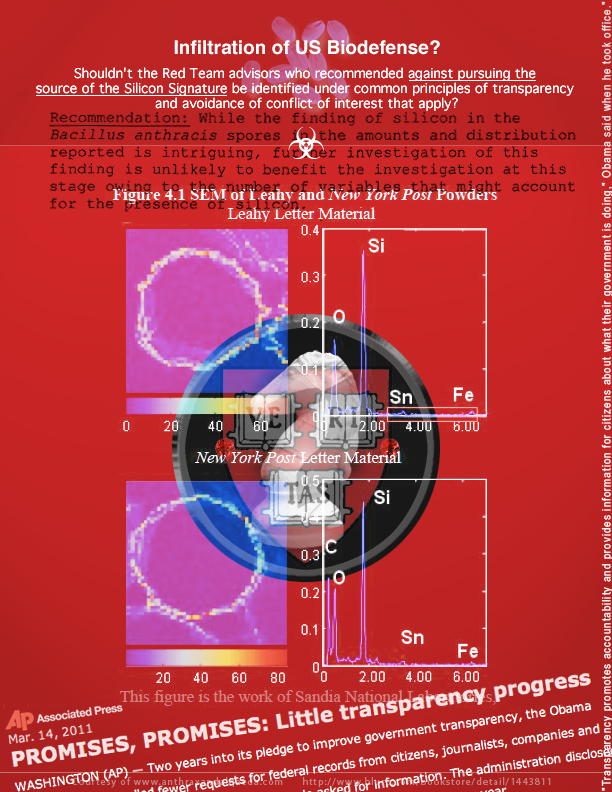 You’ll find that in the contemporaneous documents that Lew has uploaded to this blog. A revelation in the biggest heist in history comes to town next February. In March 2015, the FBI and museum will make a big publicity push to find the Isabella Gardner paintings — for which there is a $5 million reward. In February 2015, a bootleg copy of the book “Master Thieves: The Boston Gangsters Who Pulled Off the World’s Greatest Art Heist” will be available for sale here. This book “Master Thieves” has a pictured of a darkened street and a dramatic torn cover. Although it won’t officially be on sale until March, Kurkjian will be here in Syracuse in February at the university museum here. He will for the first time reveal the Herkimer, NY connection to the heist — in which Elena Guarente and her daughter teamed up with a man with a connection to Herkimer to pitch back the paintings to the museum after Bobby Guarente passed in 2004. Neither the museum nor the FBI — with the Boston Field office a former lead investigator in Amerithrax — are in a sharing mood. But everyone at least shares the wish and hope that the paintings are returned. Stephen has been on the case since 1997. But it is the investigation he did from January through mid-May 2014 — from here in Herkimer and everywhere in between — that could go into the IRE Hall of Fame. It is difficult for reporters to have the time to do deep research on a subject — they are forever being drawn to the next day’s story. But some mysteries just call out to be solved. Graeme’s book is a non-starter because it doesn’t even address Yazid Sufaat’s and Rauf Ahmad’s activities in its anthrax program. (It doesn’t even address the true crimes relating to an Ivins Theory). Politics has no proper role in true crime analysis. Graeme got his idea that Bin Laden was not responsible for 911 from Barry. It is immoral IMO to use Ottilie Lundgren’s murder as a soapbox for fringe political views. A revelation in the biggest art heist in history comes to town next February. In March 2015, the FBI and museum will make a big publicity push to find the Isabella Gardner paintings — for which there is a $5 million reward. In advance of that, in February 2015, a bootleg copy of the book “Master Thieves” will be available for sale here. This book “Master Thieves” has a pictured of a darkened street and a dramatic torn cover. Although it won’t officially be on sale until March, Kurkjian will be here in Syracuse in February at the university museum here and we’ll be able to get a copy if we drink him under the table at Dinosaurs. Neither the museum nor the FBI — with the Boston Field office head a former lead investigator in Amerithrax — are in a sharing mood. But everyone at least shares the wish and hope that the paintings are returned. 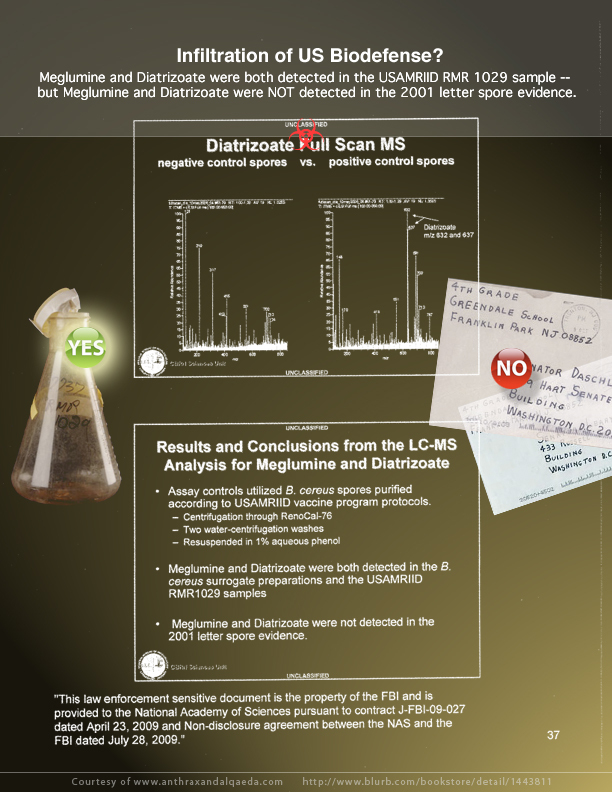 Neither the GAO report nor the NAS study actually address the evidence against Ivins. And I believe you would find that Paul Keim’s views have evolved from 2011. Dr. Keim’s role is most interesting because he knows some classified findings about the genetics study that he is not telling you. The NAS and GAO reports address aspects of microbiological forensics (the 4 morphs) that served to limit known suspects from 700-100 to “up to 377” — and that 377 was just at USAMRIID alone. There are lots of traditional forensic tests that were more probative and more potentially limiting — and that the FBI and US Attorney got wildly wrong. So let’s turn to some of the discredited evidence against Dr. Ivins. A special significance of the GAO’s report is the fact that Henry Heine says he didn’t use the technique specified by the FBI — once it showed with morphs, once it didn’t. And his anthrax, you may recall, was in Building 1412. And so right away a key factual premise outlined by Attorney General Taylor was flat out wrong. The genetically matching virulent Ames was STORED in both Building 1425 and 1412. For the GAO report not to point that out makes it add up to Daubert meets Dilbert. Another point on which US Attorney Taylor was wildly wrong on at his early August conference was the Federal Eagle stamp. He (and the AP) implied it was only sold at Dr. Ivins’ Post Office when it in fact was sold throughout Maryland and Virginia. Another point US Attorney Taylor was wildly wrong about was the imagined code in the letters. The “T” in NEXT was not in fact double-lined. Note that it took Bin Laden several years before making a full confession to 9/11. For as long as people were confused on the subject, it made sense for him to deny it. It is simply not fair to criticize the FBI for subscribing to the perfectly reasonable Hatfill and Ivins hypotheses, while folks like Barry and Graeme don’t even know that Bin Laden committed 9/11. Get a clue, people. That sort of nonsense greatly undermines opposition to an Ivins Theory. I’m turning a blind eye to what Meryl might believe on the subject because I swoon over people so wonderful. Barry and I OTOH have already taken it out in the parking lot. Following is the full English transcript of Usama bin Ladin’s speech in a videotape sent to Aljazeera. And don’t even get me started on the behavioral evidence they turn to when you point out that there is no “there there” to their science. The mistake that US Attorney Taylor most famously made related to his claim that Dr. Ivins had access to the lyophilizer on those nights. Kudos to Frontline, ProPublica and McClatchy for nailing that down so it wouldn’t move. Another central mistaken premise that US Attorney Taylor relied upon was that Dr. Ivins did not have reason to be in the lab those nights and weekends. Ivins just didn’t have access to the documents he needed years later. Somehow it works as an excuse for an agency under FOIA but a defendant can never claim he can’t find or gain access to a document. Getting these rabbit documents under FOIA literally took years. 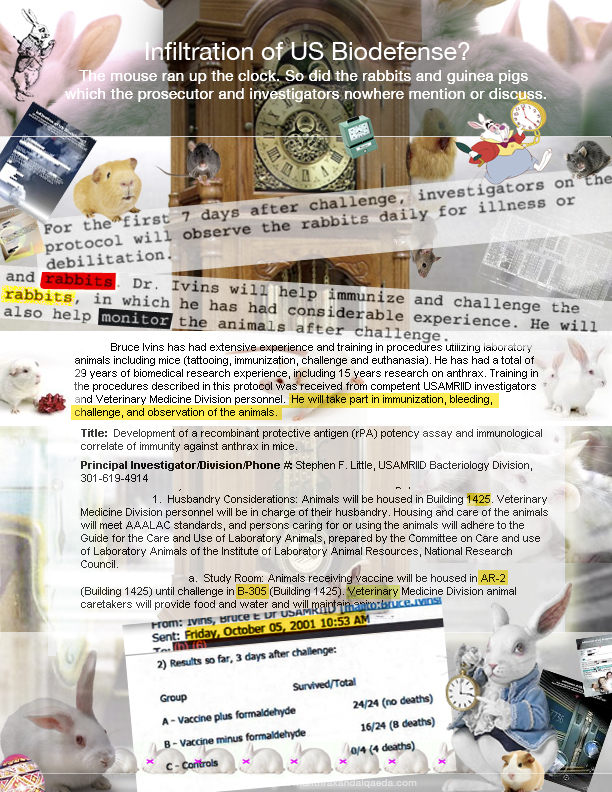 The prosecutors pushed 52 rabbits down into a hat out of sight. IMO, Amerithrax constitutes the biggest failure in counterintelligence analysis in the history of the United States. And it is a grave mistake to underestimate Dr. Ayman Zawahiri. He aims to finish what he started. I’m a big fan of the FBI and CIA. It’s never too late to get it right — until it is. Such know-how travels in mind of individuals, as has been said by so many bioweaponeers (like Alibek and Patrick). Who knows, if there was transparancy, you might find that the person who passed on the processing tricks was on the group that recommended that the FBI not pursue the probativeness of the silicon signature.